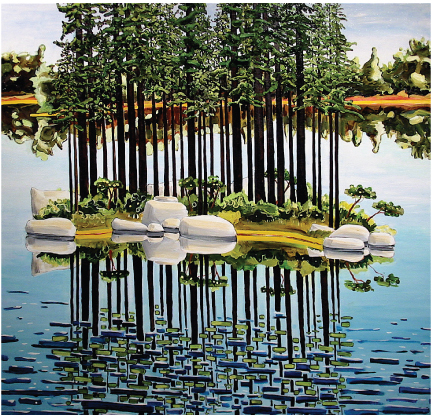 While Dane Wilson’s painting called Andy’s Island (left) looks like trees reflected in water, it’s more complicated than that. The trees and their reflection are the barcodes of books about Andy Warhol. “If you look at the image carefully, you’ll see that the trees reflected in the water don’t match the trees growing on the island,” he says. “That’s because each barcode is from a different Andy Warhol book.” The 6-foot-square oil painting is the center canvas of the triptych The Philosophical Triptych: Reflections on The Philosophy of Andy Warhol. The reflection in all three of the paintings is The Philosophy of Andy Warhol; the trees in the above painting are the barcode for I Bought Andy Warhol by Richard Polsky. He began working barcodes into his paintings three years ago. He was painting a landscape of a silhouette of trees in water, when saw the barcode on a can and realized it resembled trees. “I experimented with using barcodes in different contexts,” he says. “I’d just find a barcode off of a product that was handy, but then I realized that people who saw the paintings were also interested in the item I was taking the barcode from. I came across a book that Andy Warhol wrote, saw the barcode and had a conceptual flash since much of his work had to do with commercial products.” Andy’s Island is $3,000. Contact Dane Wilson through Rake Art Gallery (325 N.W. 6th Ave., 503-914-6391) in Portland. His solo show in May will feature a drawing of an Alpine stream on a 200-foot scroll of paper.